Since Comet helps so many student loan borrowers get on the right track financially, we wanted to study and understand how people use personal financial tools like Venmo. We saw huge potential in identifying trends regarding its public data feed, so we gathered over 18 million transactions and analyzed them. Keep reading to see some really interesting differences between the way men and women utilize the app. 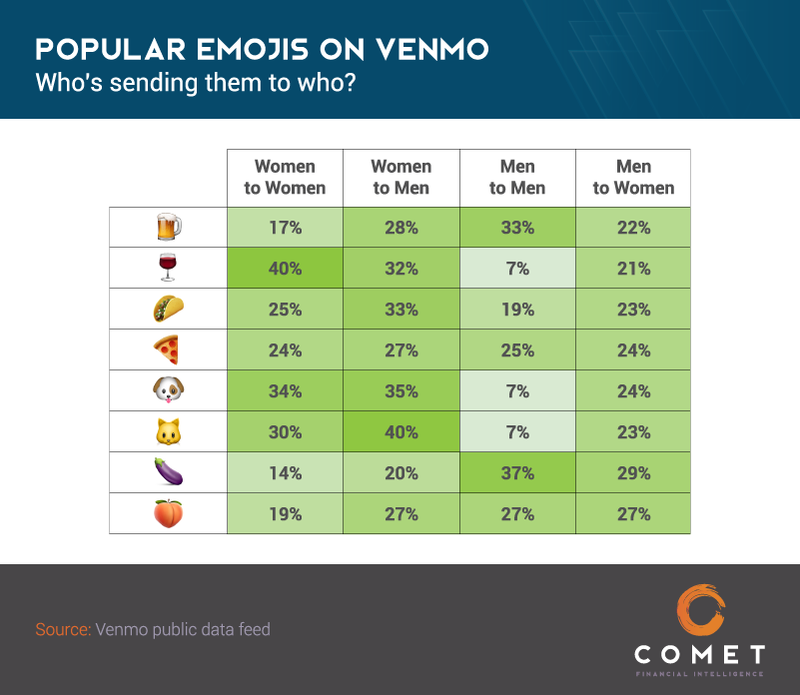 Although the newest release of emojis showcases a more diverse group of characters, traditionally female-centric emojis are alive and well with female Venmo users. Women appeared to use more hearts, sparkles, clothes, and jewelry to communicate their spending habits when compared to their male counterparts. In fact, 90% of transactions including the two hearts emoji were used by female users. Other emojis with a similar gender gap were the lipstick and bride with veil (89% each). 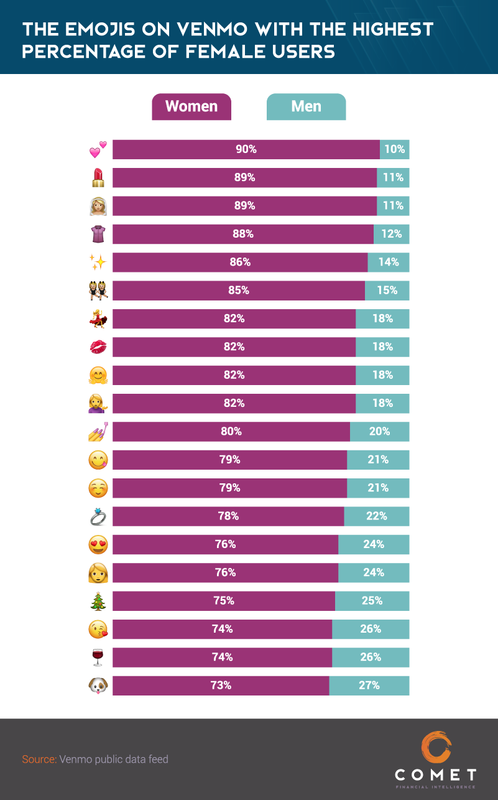 Sparkles and woman dancing also ranked highly, but even the dog face emoji was used by women 73% of the time. 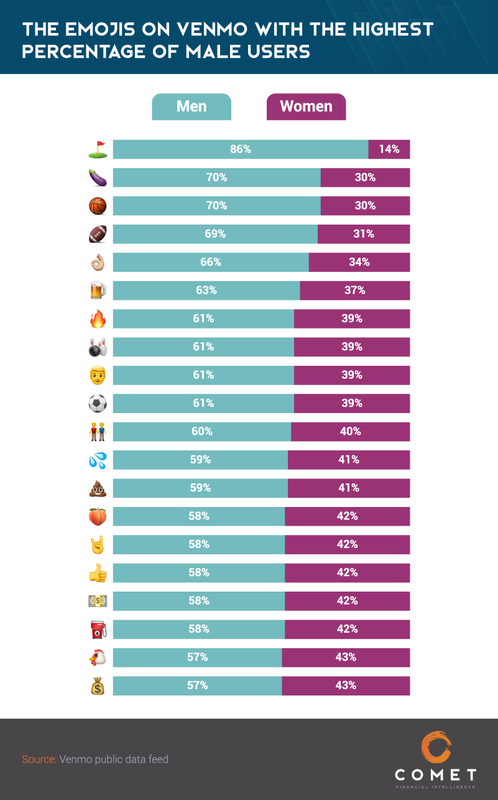 Top ranking emojis for male Venmo users seemed to be much more oriented toward traditionally masculine interests: sports, fire, and beer. As a whole, the results didn’t sway as strong toward one gender as they did for women. The money bag emoji was one used by men only somewhat more often than women. We’re not surprised, though – from our work with student loan borrowers, we know everyone appreciates a little more cash. The opposite gender may seem a strange and mysterious thing – something we’ll never come to fully understand. But modern studies are shedding light on how similar men and women truly are. When it comes to emoji usage on Venmo, however, there seems to still be some differences to work through. We looked at several popular emojis and analyzed the frequency with which men and women sent and received them. It turns out, men sent other men the beer mug emoji more frequently than any other pairing. And women were more likely to send the wine glass to other women. Dog and cat faces, pizza, tacos, and the peach emoji were also more likely to be found in female-to-male transactions. Pizza made another top appearance as the women of Venmo used this emoji most often when sending money to others. For men, pizza ranked highly too – the money with wings and pizza emojis were roughly equal. Women clearly had their priorities straight: pizza over everything. Both men and women seemed to use Venmo primarily to pay their friends for food and drinks, but rent, gas, and coffee were featured fairly frequently as well. When requesting funds, both men and women used the money with wings emoji more than any other emoji on our list. Additionally, when users of either gender requested money, the other emojis they used often suggested paying for an electric bill. Let’s hope they get the money – otherwise, it’s lights out for everybody. When we analyzed the frequency of words used in Venmo transactions, men and women seemed to be on the same wavelength. Food is still people’s most basic need – at least that’s what it looks like since men and women both used “food” more frequently than any other word. 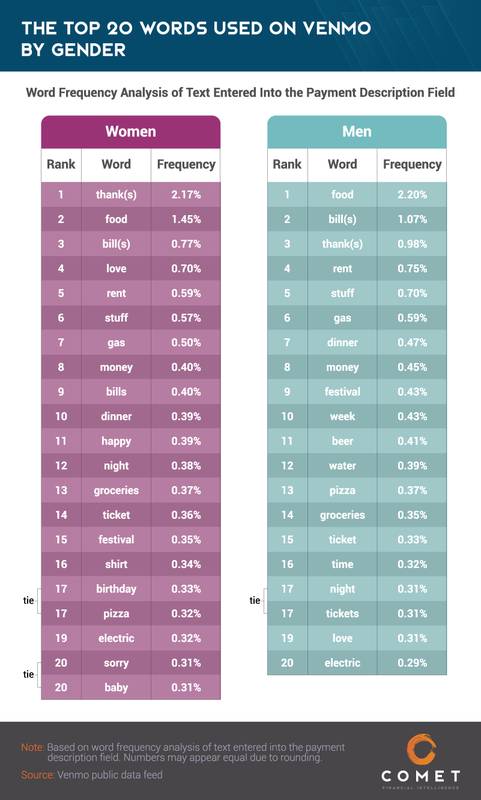 When compared to men, “thanks” and “thank” (presumably from the phrase “thank you”) ranked much more frequently for women, however. Perhaps women are more polite when it comes to money? Also ranked highly on both lists were “stuff,” “gas,” “bills,” and “rent.” To us, it looks like Venmo has really taken off when it comes to sending money for the basic essentials. For Venmo users, it’s easy to forget that sending money between people wasn’t always instantaneous. But more and more people today are coming to see the value in the simple and stress-free handling of financial obligations. If it makes payments easy, we’re all for it. That’s why at Comet, we work to help student loan borrowers find refinancing options that work for them. We gathered 18,642,310 transactions on Venmo from Nov. 1, 2017 to Nov. 29, 2017. The exact time frame studied comprised 28.88 days. These transactions included each user’s first name, transaction message, date and time, and other information. The dollar amount of each transaction was not available. To make calculations on the data set more practical to compute, we randomly selected 500,000 transactions for analysis to create this study. To identify user genders, we compiled a list of the most common male and female names and assigned a gender to the users involved in each transaction. We discarded any transactions with names that appeared on both lists of male and female names (for example, Sam). Because of this we were unable to assign gender to many of the transactions and so the analysis is likely not 100% accurate. For assets comparing top emojis, posts without emojis (emoji = null) were not included. Our sample provided 179,548 distinct transactions that included both emojis and genders. For the graphs comparing emojis with the highest percentage of male and female users, we only reported emojis that were used a minimum of 383 times to establish a 95% confidence interval with a +/- 5% margin of error. Feel free to use any of the images or findings from this page for noncommercial purposes, provided you link back here so readers can enjoy the full study. This also helps the authors receive proper credit for their work.